Castle Lite presents first ever all female hip hop concert #HipHopHerStory this September. The concert will see South Africa’s leading lady in hip hop Loot Love co-present with Lee Kasumba of Uganda. Other hip hop queens who will grace the stage are boss lady Bragga-Nadia Nakai, Dololo hit maker Rouge, Award winning Gigi Lamayne, Rapper and televisionpresenter Moozlie, 2016 SAHHAs Honorary Award recipients Godessa, South Africa’s rising hip-hop star Award-winning artist and TV personality Mzansi’s hip-hop crew Skwatta Kamp and Okzharp & Manthe Ribane, Saint Jude, Fifi Cooper, Relo, Ayanda MVP. 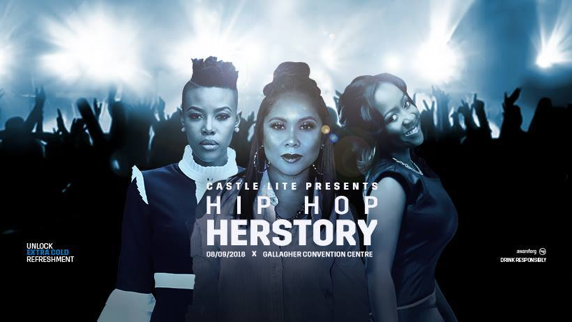 Castle Lite presents Hip Hop HerStory is working with the SA Hip Hop Awards on an initiative that will see an upcoming female hip hop act partake in a mentorship program to develop her through he Hip-Hop ranks – part of ticket proceeds will go towards this initiave. Tickets are available at Nutickets from Wednesday, 08 August 2018, starting from R150. If you love Hip Hop, all of it, join these amazing artists at this ground-breaking event on 8 September 2018.